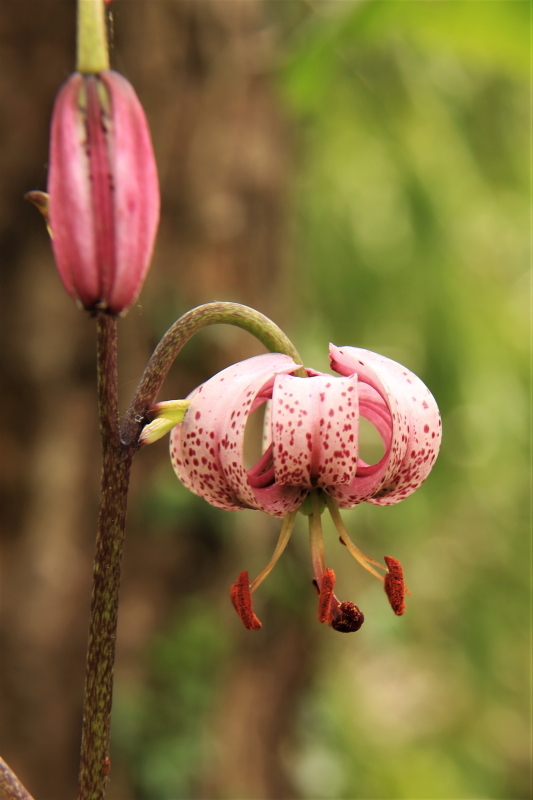 The Martagon Lily is quite a special flower, rare and quite beautiful. It is found in the Wye valley and particularly in the Tintern area. Lippetts Grove is the place to find it, this is a small reserve managed by the Gloucestershire Wildlife Trust. I recently received some information about rare wild flowers from the trust, it was a request for extra funding. The main plant they featured was the Martagon Lily. Others which they featured were the Wild Daffodil, Sword leaved Helleborine, Butterfly Orchid, and Meadow Clary, several of which I have covered in this series of blogs. I am not sure about ‘careful management’ but I will contact the wildlife trust about that and then will write an article about Lippetts Grove when I have a reply. In the meantime suffice it to say that the site has been recently felled and it is quite difficult to move round and I only found 6 specimen of the lily growing in one small patch. The little slide show below gives you a flavour of how it looks now. OK back to the lily; it is so called because the petals curve back and look a bit like the cap a Turkish person may wear. Another name for it is Turks cap lily and it is sold by many garden centres and is included in many herbaceous borders, being quite useful in more shaded areas. However judging by the number of articles on the internet about how to grow it, I suspect it is not that easy. It is obviously a bit of an upmarket species as you can buy it from Waitrose! It is recorded as being present in just 2 tetrads in the Wye valley area and these are the two which include Tintern and Brockweir and obviously Lippetts Grove. It is only recorded from 312 tetrads in the whole of the UK and Ireland, and these are mainly along the border between England and Scotland, very few in the south west or Wales. Obviously many of these recordings will be plants which have originated from garden stock. Worldwide though it grows all the way across Europe and on into Asia as far as Mongolia, so whist rare here it is not threatened on a global scale. The plants in the Wye valley are growing a long way from any habitation… as my aching back will bear testimony to, having carried all my heavy camera gear to the site and back, yesterday morning. I had some trouble locating any plants at the site and was almost ready to give up when I saw the pink blooms. They grow quite tall and have several flowers per spike, so once you see them they are quite obvious. There were just 6 individuals growing quite close together. I did not cover the entire site but spent about 2 hours there so I suspect that if there were more present, then it was not that many. This as I have indicated brings into question the recent management of the site. In the photo above you can see the whorl of leaves at the base and then the long stalk bearing just a few flowers.The plant has bulbs as do all lilies, which is how they overwinter. It is suggested that birds like Jays may dig up the bulbs and in that way aid distribution. As gardeners will know the bulb of a lily is quite a loose structure and individual swollen leaf bases will easily break of and each one of these can potentially develop into a new plant. So whilst the jay may eat some of the bulb, other bits will get distributed. If Jays do this then I would suspect other species might also look upon this as a food source, particularly grey Squirrels. The other method of propagation is by seeds, the flowers will develop into quite large seed pods and the seeds are relatively heavy and will be flung from the pod when it is windy, but will not travel that far. Please note that according to Wikipedia, all parts of this plant are extremely toxic to cats and it is advised that people who have a pet cat should not plant it in their garden. Evidently even brushing past the flowers could result in pollen being deposited on the cats fur which it will subsequently wash off and cause it some distress/death. How this ties in with Jays eating it I am not sure. Update (June 2018) I was walking round some local woods in the Wye valley region not looking for anything in particular, I had photographed some Marsh thistles which I needed for this blog, also some spurge that looked different to the normal wood spurge when I saw a deer off to my left. I stood still but it knew I was there and after a bit it moved off. I then noticed a little way off from the path that I was o some pink flowers, tall and quite large with 4 or 5 flowers per stalk. I knew what they were and carefully went over and took lots of photos. There were abut 15 individuals and they were all grouped in one fairly small region. I did look around a bit further away but did not find any more. Here are some of the photos of this group.